Thank you for your interest in my writing and for your encouragement and support as I make progress on writing a better book and then getting it published. I wanted to share this update on No Easy Money and to ask for your help on the next steps. You can help with both finishing the book and preparing the marketing plan …. If you’re interested and have the time. Or you can wait until the book is available, then just buy it, read it, love it and recommend it. That request will be coming soon! 1. 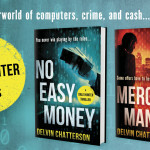 If you would like to proofread or review a final manuscript of the novel No Easy Money, just email me and let me know. I’ll send you a word document or an e-book copy, as soon as it’s ready. Meanwhile, I’m doing the final, final edit and re-writes and setting up a crowdfunding campaign at Indiegogo to promote and launch the book. DelvinChatterson.com or my Author Facebook Page. Please continue to enjoy all your reading and remember that I welcome any tips, ideas or suggestions that will help me write a better book and deliver it to readers who will like it. I’ll be pleased to keep you advised of my progress.